I am an ESL teacher working with mainly 40+ 2nd grade students at an International School. Absolutely love my job! 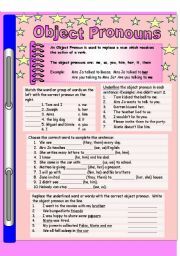 Simple object pronoun worksheet with brief explanation, examples and 4 different types of exercises. The sheet is fully editable and I hope it is useful. Happy teaching :) Thanks to Lizsantiago for the template. 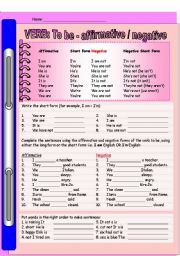 Simple one page worksheet for elementary students. Containing the verb to be including the affirmative, negative and contractions. There are 36 easy questions. Fully editable. Hope it helps! Happy teaching everyone :) Many thanks to lizsantiago for the template. 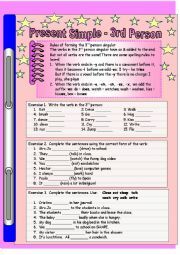 Easy worksheet covering the Simple Present Tense with 3 exercises and an explanation of the spelling rules when using veerbs in the 3rd person. Hope it helps! Many thanks to Lizsantiago for the template. 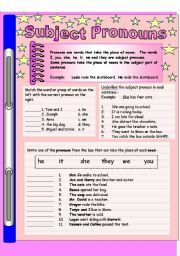 Simple worksheet covering Subject Pronouns. There are 3 exercises to complete and it is fully editable. Hope you enjoy and it is useful ... happy teaching :) Many thanks to Lizsantiago for the template. Simple worksheet containing detail of the verb To have / To have got with affirmative, negative and contractions. Including 28 simple questions. Fully editable. Hope it helps and happy teaching :) Many thanks to Lizsantiago for the template. 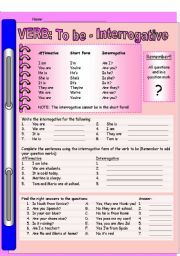 Simple one page worksheet for elementary students containing the verb to be - interrogative. 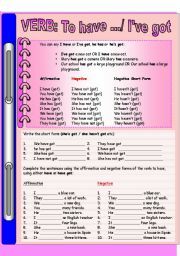 The sheet includes the affirmative, the contraction and the interrogative form of the verb. In addition there are 25 easy questions. The worksheet is fully editable. Hope it helps! Happy teaching everyone :) Thanks to Lizsantiago for the template. 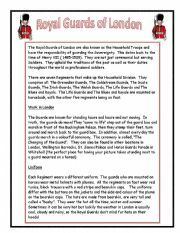 Just a simple four page worksheet regarding the Royal Guards of London. The worksheet includes a brief history of the guards, their work and their uniforms followed by comprehension questions, vocabulary and a poem by A.A. Milne, Buckingham Palace. Hope it is useful and it helps! Happy teaching :) The worksheet is fully editable.